What Was So Enlightened About That? I remember being introduced to the Enlightenment during my senior year in college, in a course officially denominated 18th Century European Intellectual History or something to that effect. In this course, the professor, a kind, scholarly gentleman whose specialty was Diderot, introduced his clueless undergraduate charges to a sort of Hall of Fame of Enlightenment philosophes and other enlightened figures. In addition to his beloved Diderot, we met Voltaire, Montesquieu, Frederick the Great (an “enlightened despot”), and a host of others. I recall that our professor even allowed Jean-Jacques Rousseau to make a brief and tightly-regulated appearance. I couldn’t help but like the Enlightenment figures’ emphasis on science, reason, and empirical thinking rather than religion; their belief in the equality of all men – for some, even the equality of all men and women; and their willingness to rethink the “timeless verities” that had been handed down from century to century in Europe. But as I identified with the enlightened figures of the 18th century, I was consistently brought back to a harsher reality: hadn’t I learned in a previous year’s introductory European History course that the 18th century ended rather badly for France, the epicenter of the Enlightenment? Didn’t the French Revolution that began so nobly with a Declaration of the Rights of Man degenerate into a guillotined bloodbath, with some of the revered Enlightenment figures finding themselves on the chopping block for politically incorrect thinking or insufficient revolutionary zeal? Wasn’t our text punctuated with several gruesome sketches of the guillotine in action? And didn’t that revolutionary zeal inspire a pesky little guy named Napoleon to launch a European war of conquest? What was so enlightened about that? In the decades since that course, I have instinctively felt the need to check my natural enthusiasm for the ideals of the Enlightenment by reminding myself of the ignominious ending to the French Revolution, followed by Napoleonic wars of conquest. Anthony Pagden’s The Enlightenment and Why It Still Matters seeks to uncouple the Enlightenment from the darker chapters of the Revolution and the Napoleonic era. Pagden’s answer to why the Enlightenment still matters, his somewhat aggressive, in-your-face title, is that it continues to be the baseline for the “broadly secular, experimental, individualist and progressive intellectual world” we inhabit today (p.x-xi). 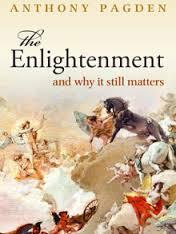 By insisting on “its own unfinished nature,” the Enlightenment “quite simply created the modern world. It is . . . impossible to imagine any aspect of contemporary life in the West without it” (p. 408). In particular, Pagden concludes that modern liberal democracy, the form of political system which, “for better and sometimes for worse, governs most modern societies,” is a “creation of the Enlightenment, refined and institutionalized during the course of the nineteenth century” (p.412-13). Nonetheless, the struggle over the legacy of the Enlightenment remains one of the “most persistent, most troubling, and increasingly most divisive” of the ideological divisions within the modern world (p.ix). For Pagden, the Enlightenment arose during the “long” 18th century, the last decade of the 17th century through the first decade of the 19th, in the aftermath of the 17th century’s religious wars and the accompanying breakdown of the authority and intellectual unity of the Catholic church. These wars, the Reformation, the “theologically destabilizing impact of the revival of Skepticism,” and the discovery of the Americas had “dealt all the self-assured claims of the theologians a blow from which they never recovered’ (p.96). By the end of the 17th century, Christianity was no longer able to provide the “intellectual and consequently moral certainty that it once had done” (p.406). Pagden describes two broad, intertwined intellectual trends which marked the Enlightenment: reliance upon science and reason, rather the religion and theology, to explain the human species and the universe; and what he calls the cosmopolitanism of the Enlightenment, its emphasis upon what unites the human species across a vast array of cultures and languages. Pagden sets out these trends in eight erudite if sometimes difficult to follow chapters, each with a snappy title (e.g. “Bringing Pity Back In”; “The Fatherless World”). The most argumentative portion – and for me the most enticing – is his conclusion, entitled “Enlightenment and Its Enemies,” evoking Karl Popper’s World War II-era defense of liberal democracy, The Open Society and Its Enemies. The Enlightenment can be studied from numerous angles, but most encompass the study of the thinking of Europe’s enlightened figures, a “self-appointed elite” whose members were, as Pagden phrases it, marked by their “intellectual gifts, their open-mindedness, their benevolence toward their fellow human beings. . . and their generosity” (p.322). Each student of the period has his or her own favorite figures. My undergraduate course seemed to turn around Diderot, whereas Pagden’s interpretation gives preeminent place to two philosophers who thrived outside France, the Scottish David Hume and the German Immanuel Kant. Although the thinking of each ranged broadly, Hume personifies for Pagden the secular thread of the Enlightenment, the effort to supplant religious and theological explanations of man and the universe with a “science of man,” based on such notions as “sentiment,” “empathy, “and “virtue,” rather than simple self-preservation, as Thomas Hobbes, the 17th century English philosopher and quasi-atheist, had posited. In somewhat different terms, both Hume and Kant articulated the Enlightenment’s cosmopolitan universalism. Hume became the “single most influential proponent of a secular ethics based upon a ‘science of man’ which the Enlightenment ever produced” (p.153), Pagden writes. For Hume, the world’s religions – those “sick men’s dreams,” as he called them (p.125) — had only muddled, corrupted and complicated human lives. His demolition of religion was, Pagden argues, “more assertive, better argued, more profound, and has been more long-standing than that of any philosopher besides Kant” (p.146). Moreover, unlike Kant, Hume was “able to demonstrate that religious belief could not exist ‘within the limits of reason alone,’” using Kant’s phrase (p.146). Hume agreed with the Old Testament view that “however varied actual human beings might be, they all shared a common identity as humans,” with “no universal difference discernible in the human species” (p.162). For Hume, “habits,” “manners,” “customs,” are the stuff of which our worlds are made. All that distinguished the “wisest European from the most ignorant ‘savage’ or ‘barbarian’ is precisely the same as that which distinguishes one ‘civilized’ people from another . . . custom, law, habit, and social expectations” (p.163). Pagden cautiously endorses the view of Kant as the “first of the modern liberals” and the first to claim that “modern liberal democracy was bound eventually to become the form of government that all enlightened and civilized peoples would one day embrace” (p.358). Kant’s “cosmopolitan right,” the vision of humanity moving steadily toward a future free of strife and hostility, in which all humans might pursue their own individual ends without endangering those of others, was the “inescapable conclusion of the Enlightenment project” (p.370). Kant, who paradoxically never traveled more than 30 miles away from his native Konigsberg in Germany, also foreshadowed the 20th and 21st century movements toward international justice. Kant’s Toward Perpetual Peace, written in the aftermath of the 1795 Peace of Basel, which ended the War of the First Coalition between Europe’s principal monarchies and revolutionary France, set out Kant’s views on ending the scourge of war. In this tract, Kant laid out the case for a hypothetical universal peace treaty that could “ensure the future and inescapably cosmopolitan development of the human race” (p.349). The influence of Toward Perpetual Peace can be seen not only in “contemporary discussions over global governance and global justice but also in the creation of the universal institutions to sustain them, in the League of Nations, the United Nations, and perhaps most closely of all, the European Union” (p.349-50). In bringing the secular, scientific and cosmopolitan threads of the Enlightenment together, Hume and Kant enunciated the Enlightenment objective of creating a “historically grounded human science that would one day lead to the creation of a universal civilization capable of making all individuals independent, autonomous, freed of dictates from above and below, self-knowing, and dependent only on one another for survival” (p.371). After setting forth the essential threads of the Enlightenment and highlighting its most consequential thinkers, Pagden finishes with his provocative conclusion, “Enlightenment and Its Enemies,” in which he discusses the case against the Enlightenment. The case amounts to an assault against modernity, Pagden contends, based on “some caricature of a project to reduce all human life to a set of rational calculations” (p.406). Under this view, the Enlightenment produced a culture “devoid of direction and purpose” because the Enlightenment was “fundamentally wrong about morality” as being discoverable by reason alone (p.397). Without the guidelines of tradition, custom and systems of religious belief which the Enlightenment sought to strip away, “humans are lost” and the Western world has been “suffering for it ever since” (p.398). What might be termed the German 4H club, Herder, Heine, and Hegel in the 19th century, and Heidegger in the 20th, propounded the view of the Enlightenment as a “cold, toneless, monstrous and calculating . . . It had tried to crush all of human life, difference, heroism, and desire” (p.387). Over the centuries, Enlightenment, the “Rights of Man,” “Republicanism,” and Kant’s “Cosmopolitanism” all came to be identified in the minds of conservative elites with the destructive power of the French Revolution. Or, as Friederich Karl von Moser, an 18th German jurist and government official, more succinctly put it, Enlightenment “begins with philosophy and ends with scalping and cannibalism” (p.381). In response, Pagden comes to what is for me the crux of his argument on behalf of the Enlightenment. Any direct causal link between the Enlightenment and the darker side of the French Revolution, he asserts, is “spurious” (p.389). Had the Enlightenment in fact been a precursor to the Revolution and to Napoleon, he writes, “it would not be of much lasting importance” (p.389). For all its excesses, the Revolution and the Napoleonic era were a “necessary evil” that “ultimately cleared the way for the liberal-democratic order that ultimately came to replace the ancient regime throughout Europe” (p.389). That doesn’t sound to me like an argument that the links between the Enlightenment and the French Revolution are “spurious” (which my dictionary defines as “of falsified or erroneously attributed origin”). Rather, Pagden’s account seems to acknowledge that the Revolution and Napoleonic era were intertwined with the Enlightenment, and it is difficult to see how one could argue otherwise. After the horrendous wars and genocides of the 20th century, we know that we cannot always count on reason to prevail. There is still tribalism of many sorts that precludes us from seeing the common humanity linking individuals across the globe, and atrocities are committed in the name of religion nearly every day. But the Enlightenment impulses represent for me now, as they did in that classroom several decades ago, the more noble side of human beings and human experience – if only I could only rid my mind of those guillotine sketches in my college textbook.